In today's time, almost everyone leads a busy life with a tight schedule almost every day. In such a scenario, planning and then packing a gift for someone can be a daunting task. 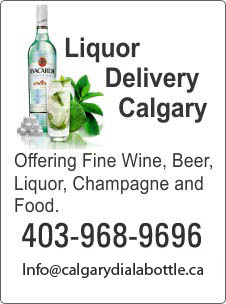 However, there are solutions available and one of the reliable names you can bank on is gift delivery Calgary. We not only provide you with myriad options of gift items but also provide a nice gift wrapping service. Gifting a bottle of alcohol can be a nice idea. In fact, it is much better than gifting those age old traditional gifts like chocolates etc. We have a large variety of liquor available and you can gift a bottle of wine or champagne. This is not all. If it is something exotic you are looking for, we will provide you with that too. Hence you can also gift a bottle of that exotic wine to someone special. We have a tie up with a number of liquor stores and hence you will not be disappointed no matter what kind of liquor you order. We will deliver it. Also, we have a well organized gift delivery system. We take care of everything. Right from picking a right bottle of alcohol, and wrapping it up nicely to delivering it to its destination, we ensure everything goes well. We do not just settle for anything substandard. We put in efforts so as to pick the best bottle for gifting and also add that special touch to it by wrapping it in a creative manner. Our gift delivery system is such that we guarantee the delivery of the order within an hour. We deliver gifts all over the city. We have experienced and professional staff members who are familiar with the entire city and ensure a timely delivery of the order. We value our customers and leave no stone unturned in providing them with the best service. In fact, delivering quality service is what we excel in. When it comes to price, you will be surprised to know that we offer quality service at a very economical rate. Thus, gifting that bottle of alcohol to someone would not really loosen up your purse strings too much. Moreover, you get full value for your money as we team up our quality products with a nice gift delivery system. So next time you plan to gift someone a bottle of alcohol, just give us a call.